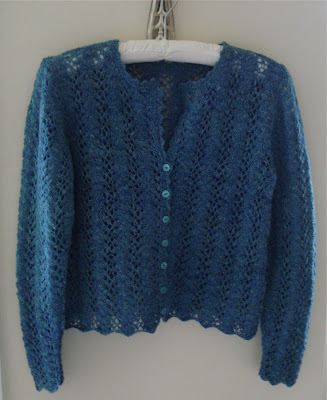 My Vine Lace Cardi is all finished! It felt really good to sew the last button on this and I can't wait to wear it! This is my first ever sweater from my handspun. 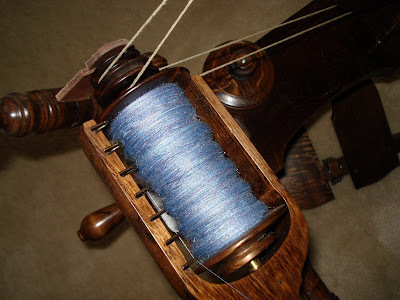 All the details: The yarn was spun from Spinner's Hill batts, one ply was blue green, and the other was a blue, somewhere between royal and denim. I alternated skeins throughout the entire sweater to blend them together and make spinning differences less obvious. I used the traditional Vine Lace stitch pattern and found an edging stitch pattern for the neck band and front bands. The edging pattern came from a Classic Elite leaflet and the best part was that you end up with a YO in the center of each point which you can use as a buttonhole or just leave as a decorative YO. This meant I didn't have to figure out how many buttons I wanted and where I wanted them before hand. As you can see from the top picture, I stopped the buttons part way up instead of going all the way to the top. I did this for a couple of reasons: I won't wear it buttoned higher than the highest button, and this sweater is so lightweight, I was afraid if I took the buttons all the way to the top it might make the neckline flop down on that side. (BTW, the buttons are photographing slightly lighter than they are in real life because of the flash - they actually blend much better.) So, how light is this sweater? 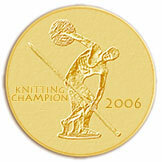 Well, when I weighed it before I sewed the buttons on, it weighed 5 5/8 ounces (159.75 grams). Here is one last picture, the lace in the window artsy shot. The Green Moss is Spreading! Well, yesterday I got a bunch more done on the Green Moss Shawl - 18 rows more to be exact! I'm now 40 rows from being done with the center. 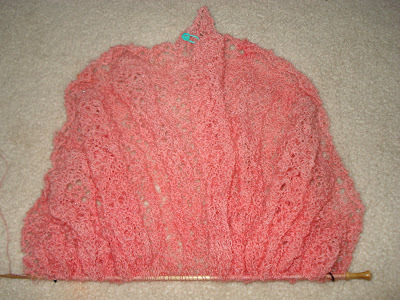 (After I finish the center, I have to knit the edging across the top - scary!) I've moved it over to circular needles now since it was getting pretty big for the straights, so I can spread it out a little bit more than I could yesterday morning. You can really see the semi circular shape on it in this picture. I think it's interesting, because if you asked me to design a semi circle (or circle) shaped shawl, I would base it on EZ's Pi Shawl design. 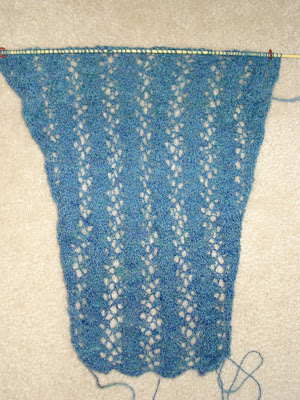 Sharon Miller has put all the shaping between the center part of the shawl and the edging. It has probably meant a lot more charting on her part for this pattern, but the center design isn't interrupted by a round of increases the way the Pi shawls grow. Ramius and Finn would like to thank you for your comments. I've been meaning to get them back on the blog for a while, but I take most of my blog pictures in the morning right before I actually blog, and that's when Ramius is turning in from a night of doing who knows what, and Finn is wiggling around the kitchen talking (he sounds freakishly like Chewbacca and actually answers to Wookie now) to me about how famished he is and how he needs his breakfast NOW or he'll probably just starve to death right there in the middle of the kitchen. Once he swallows his breakfast (in almost a single gulp), he gives a giant doggy belch (classy dog, huh? ), and then wanders over to Caleb to beg for some Cheerios. It's sad, sad thing the way this dog lives. I hope you all have a great weekend! I'm going to be finishing up the Vine Lace Cardi (yes, I found the perfect button/front bands for it) and trying to get more done on this shawl. Last night I was able to work on the Green Moss Shawl again. I got a whopping 12 rows done on it, but if I'm doing the math right, I only have 58 more rows to go! This is working up pretty quickly, but it's also big enough that it just looks like an apricot blob. I think that AI might be the best ever TV show for knitting, you can glance up occasionally, but there are plenty of stretches where you can just knit and listen. And if you watched last night you know the truth, Elvis is alive, baby! Also I had no idea that House had an accent (although technically, I guess it's Hugh Laurie that has the accent). There's just SO much to learn on TV! OK, now that I've crushed my parents dreams of me being invited to join Mensa, let's get to the fun stuff! Ramius graced us with his presence this morning before going to take a nap and he even let me get a few pictures. Above you can see him showing us the eyes of a vampire cat. 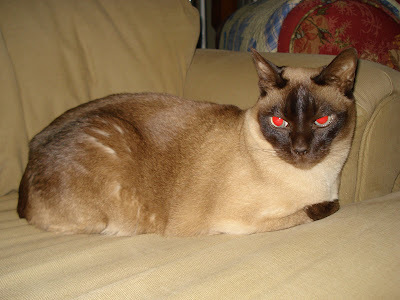 I actually used to call him Count Pounceula. 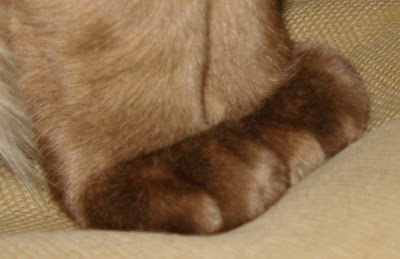 This might be one of my all time favorite picture of him - kitty toes! How cute! How tiny! How chocolatey brown! I'll probably be setting this one as my wallpaper later today. 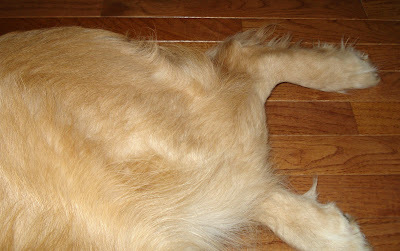 Since it's fun to take pictures of animal parts, (and Finn was laying in my lap making taking pictures very difficult) I give you Doggy Drumstick! This is the left drumstick. Finn is actually so tickly of tummy, that we can get both drumsticks kicking if we rub his tum in the right places. It's hysterical. Our previous dog, Bear, would only kick one side at a time. 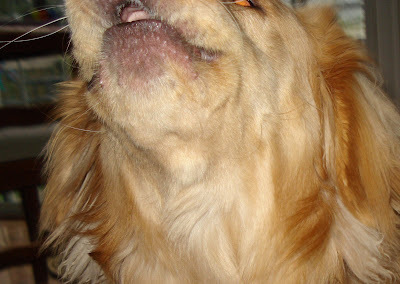 Finally, I leave you with, "Woof!" Oh, Look! Another Squinky Looking Sleeve Thing! Yes, this is the second sleeve from the Vine Lace Cardi or, as I'm sure we're all beginning to think of it, The-When-Will-It-Ever-End? I'm about 8 rows from the beginning of the sleeve cap shaping and I really, REALLY hope to get the silly thing finished today. It would be great if I could get both sleeves blocked out today, but with the timeline that this cardi is taking, that should probably be saved for next week. I don't think I've ever said it, and I don't know if you've realized it, but this is actually the first sweater I've ever done with my handspun. I bought the spinning batts from Spinner's Hill at MDS&W two years ago and got the yarn spun up before last year's show. Then it marinated in the stash until I decided what I was going to do with it, and now it's finally being knitted up. I do have another sweater's worth of handspun sitting in the stash that was actually spun before I spun this - it's undyed white Falkland spun to around a worsted weight (I haven't tried a gauge swatch yet). OK, that's about all I have to say today. I promise, if you haven't given up on reading this blog, I will have something interesting tomorrow. It might be Finn and Ramius (not together, Heaven forbid) but it will be better than a sleeve part laying on the carpet looking all shrivelled and sad. 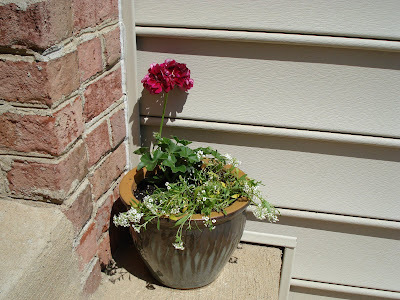 I've tried to grow flowers in pots every year, with varying degrees of success and I've found a few things that seem to work without being crazy high maintenance. (Crazy high maintenance plants are often referred to as "dead" around my house. If you're high maintenance, you'd better talk, meow, or groan like a Wookie (Finn) because otherwise you're going to be overlooked as I take care of all the other high maintenance things around here, including myself.) In the front we get lots of sun all day long and I've found that geraniums will look good and bloom all summer pretty easily, as long as I keep them watered. I've got several pots like this on the stairs and a big one on our sidewalk. I was going to go with red geraniums, but then I found these dark magenta ones and I thought they would be fun. In the front is Alyssum or something like that. It smells good and I thought it would look nice with the dark geraniums. I've never tried it before so I have no clue how it will do, but if it snuffs it, the geraniums will fill out the pots nicely. On our back deck, we get sun in the morning and late afternoon until the sun goes down, but its protected from sun during the hottest part of the day. I love impatiens on the deck. They bloom like crazy and will last all summer as long as I keep them watered well. By the time school starts, they're starting to look scraggly and leggy, but if you bloomed all summer, you probably would too. I found some in a pretty coral pink this year and added a white one to the big pot. 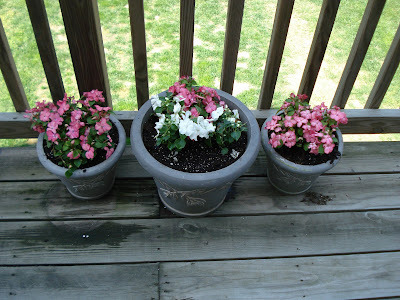 When they fill in the pots, they will be a pretty splash of color on the deck. Caleb wanted in on the planting fun, so I picked up some small pots in bright colors with matching saucers and he planted up some herbs (yes, I know its easier to buy them pre grown, but when you're 6, you want to grow stuff from seed). From left to right, the pots have Spearmint, Rosemary, and Basil. I've grown Spearmint and Basil from seed before but never Rosemary. I figure growing plants that he can nibble on will be fun for him and he's very excited about the seeds sprouting. I've explained that it will take about 2 weeks for them to sprout, but he checks them every few hours just in case. You never know with nature. 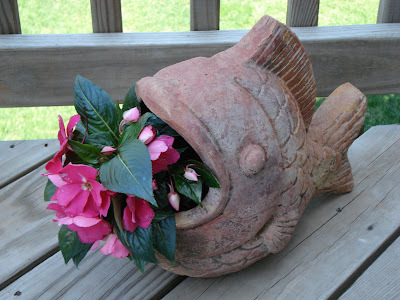 Finally, my all time favorite planter, the patio fish (although in this particular house, it's the deck fish). I got some New Guinea Impatiens or possibly New Zealand Impatiens for the fish - I can't remember, but its a new something or other from that part of the world type of impatiens. The growing conditions are the same as regular impatiens, but the flowers and the leaves are both more substantial than regular impatiens. These might actually come through a rain storm without looking like a drowned rat. Now all I have to do is remember to water everything and hopefully we should have bright colors all summer long! I've gotten a start on my second Twisted Flower Sock! I feel like I didn't get a whole lot done this weekend, but I think that the problem is that I didn't get a whole lot done that I can show you right now. I got a freakish amount of laundry done Saturday, but who wants to see that? I got the charts handdrawn out for the beginning/quickie stole pattern but you can't see that until its all done. I have more ideas floating around in my brain for MS3 - both concrete ideas and the more fluid, wispy ideas that drift away if you try to really examine them, but for some reason these are the kind of ideas that do the most to shape a project. I can't show you my ideas, and really, trust me on this one, you don't want to see the inside of my head. I also started a little surprise for next week since I'll be at the Spinning Class -YiPPPEEeeeee! Again, it's a surprise, so you'll have to wait. Basically what I'm left with is a sock part. Ta Da! Sheila of the Comments Last Friday asked how hard it was to memorize the repeat for this sock. Well, Sheila, what you see above (minus the ribbing, which I did memorize) is almost a full repeat. Each repeat is 18 stitches wide (one needle's worth) by 32 rounds. While there is a rhythm to it and I can predict what's going to happen, I still don't feel like I know it well enough to work without the chart right next to me, particularly when I'm watching TV. This is definitely not a pair of socks that I can drag around and work a bit here, a bit there and have a finished sock while I'm waiting for the water to boil for macaroni. I can't even work on this on the phone. (I can't do anything from a chart while I'm on the phone - it probably took me longer to figure this out than it should have, but there you have it.) So while this is not a portable sock project the way most are, in the end I'll have a really stunning pair of socks and it will all be worth it. My next sock project will definitely be an easy to memorize repeat so I can knit them on autopilot. 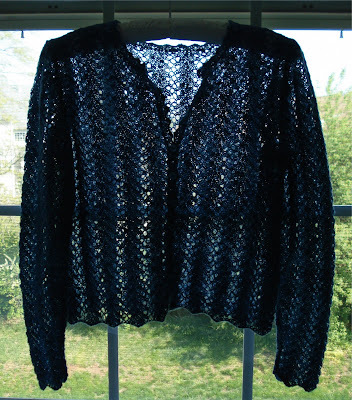 I did finish my first sleeve for the Vine Lace Cardi and it fits nicely into the armhole! (Or it will once it's blocked.) I'm going to wait to block it with the second sleeve so I get them the same size - always a nice touch with sleeves. Thanks for all the comments on finishing this sweater, but I forgot to mention one crucial piece of information - I don't crochet. At all. I can make a chain for a provisional cast on, but I would even mess that up before I learned to work it over the needle. Second most important piece of information here - I really have no interest in learning to crochet. I've seen some crochet that is really pretty and I know it can be useful to know even as a knitter, but for some reason I am crochet resistant. And since crochet is not the Borg, resistance is not futile. It's worked pretty well for me so far. Today's big event will be working on the second sleeve. I feel like I might be able to get it done since these sleeves are really pretty quick. Then I can devote all my energy to finding the perfect bands for the buttons and neck of this sweater. If it doesn't warm up around here soon, I might need this for MDS&W! In other things that are finished but not finished, I got the foot done and all the toe decreases worked on my first Twisted Flower Sock. 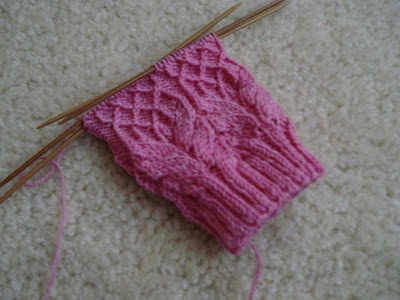 As you can see above, all I have left to do here is Kitchener Stitch the toe closed and knit a second sock. That's when we'll find out if the notes I made about the changes I made to the pattern on the first sock are clear enough to repeat for the second sock. It's always an adventure around here! Finally, I don't know if I'll be blogging tomorrow (how many sleeves and pink sock parts can you really handle?). In addition to working on the second sleeve and possibly starting a new sock, I have some ideas for some new patterns. One of them is potentially Mystery Stole 3 - no, I don't know when it will start, no I don't have a group set up for it, no I don't know what the yardage needed will be or anything else yet. I promise that I will let you all know just as soon as I know though - sound good? The second idea is for a very simple stole, possibly ideal for a first lace project, and I'm trying to come up with something that works up pretty quickly. 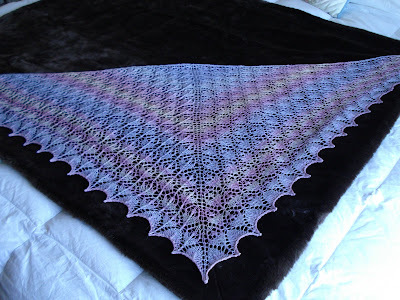 I periodically get an email from people who have an event/gift/some occasion in 3-5 weeks and want to know if one of my shawl patterns is doable in that time frame. My plan with this second design is to come up with something simple that uses great yarn and is doable in a very short time frame. Oh, and one other teaser, every time I sit down to doodle ideas and put patterns together, Jimmy Buffet's Margaritaville is going through my head. And now its going through your head too! I haven't lost the Vine Lace Cardi, in case you're wondering. I had to do some re figuring on the sleeves because I just guessed at my arm measurements when I started figuring them out. Guessing at arm measurements is almost never a good idea. So, like the heel flap on the socks for yesterday, I had to have some time to sit down and think clearly (without Ramius trying to climb in my lap, Finn trying to attack Caleb, or Caleb standing next to me singing the James Bond theme and telling me he's bored). I finally got that time yesterday, but Ramius did end up helping - he's helped before on knitting stuff though so we have kind of a system. As you see above, I got quite a bit done on the first sleeve after I did my re figuring. I'm 8 rows away from starting the sleeve cap shaping (must remember to put in a life line). I hope to finish the sleeve cap today and then I can check to see if it fits into the armhole of the sweater before I knit the second sleeve. I've got to decide what kind of front and neck edgings I'm going to use on this. They have to be narrow because this sweater is so lightweight and the lace makes it look even more open, wide or heavy looking bands will look terrible. Any ideas? 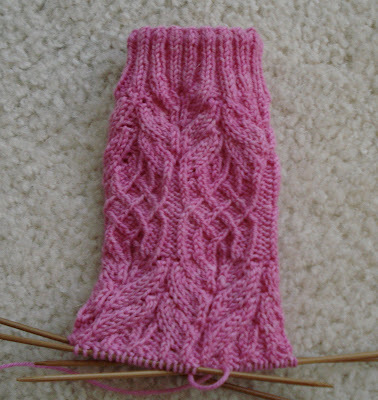 I've gotten past the heel and just barely past the gusset for my first Twisted Flower Sock! It's been sitting patiently, waiting for me to have some time to sit down and figure out what to do for the heel. Cookie A. has designed the sock with the flower petals going down the heel flap, which is gorgeous and interesting and totally looks great on the sock. I don't wear clogs though and that's the shoe style you need to show off a pretty heel flap so I decided to work a traditional heel flap in Heel Stitch because it would wear better in my shoes. Once I sat down and figured out how I was going to tweak the pattern (taking plenty of notes so the second sock will be the same), it didn't take too long to get where I'm at. Now it's just smooth sailing down the foot to the toe! I am still in love with these socks, the way the flower petals flow into the twisted stitch part of the design and back again makes me feel a little woozy. 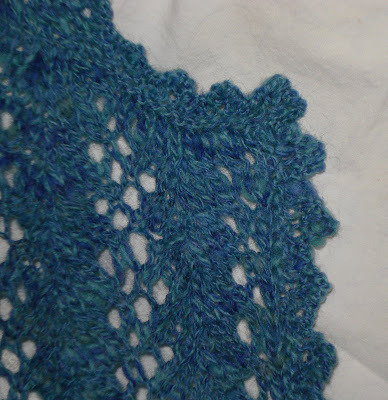 Perhaps it was watching the sock's stitch pattern take shape, perhaps it was the finishing of the Flower Basket Shawl (thanks for all the comments by the way! I'd love to reply but Blogger doesn't allow that kind of thing with their comments - blech), whatever it was, we decided to do another puzzle. After all, Finn is 10 months old now. Certainly he has reached a level of maturity over where he was at, um, 9 months old? Surely we have learned to keep the puzzle pieces on the table. We can do this - can't we? 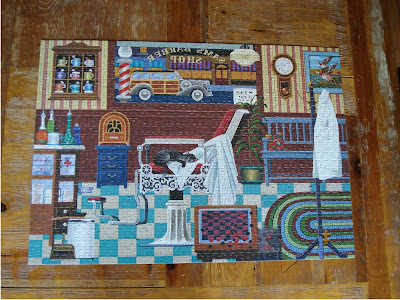 The 999 piece Barber Shop puzzle (look in the lower right corner). Puzzle Pup strikes again! Does anyone know what the world record is for the largest collection of puzzles missing a piece or two? We might be giving it a run pretty soon. The Green Moss is Spreading! And its still not green. Well, I'm 78 rows into my Green Moss Shawl now. It is definitely a half circle shape as you can see, and also desperately needs a good blocking. I think with the combination of the fuzzy yarn, large needles, and being garter stitch (my first ever garter stitch shawl), there just isn't going to be that much to see pre-blocking other than a larger and larger blob of apricot stuff I'm calling lace. You'll have to take my word for it! Also, as you can see, I am continuing in my avoidance of circular needles when at all possible - I'm going to do my best to fit this entire shawl on straights. Because I'm crazy like that. My original plan was to make the larger version of this pattern (Heirloom Knitting's Green Moss Shawl - scroll down to the previous apricot blob entry for a link), but then I realized that with this color, it will be a Spring and Summer kind of wrap and if I make the big version, it could hang lower than a skirt and then I would look like Naked Shawl Woman*. (The larger version is 40 something inches wide, the smaller version is 32 inches wide.) So, since I hadn't gotten to the place where the directions are different, it was easy to change gears and switch over to the smaller version. So, at this point, according to the directions (very well written and thank you so much for switching the charts around for the two different sides of the edging so I don't have to A) re chart them myself or B) reverse them in my head, possibly hurting myself in the process and forever questioning whether / is K2tog or SSK, resulting in my giving up lace knitting for all eternity and needing lots of counseling and medication because my brain was fried by a /). Where was I? Oh yeah! 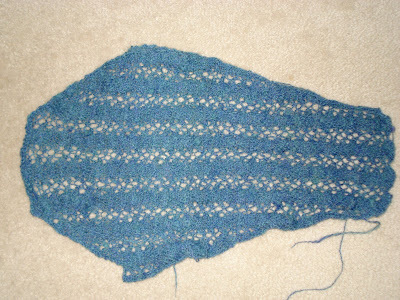 OK, so according to the directions, I have 76 more rows to go before I knit the edging along the top edge of the shawl. Since I've done 78 rows, that means I'm more than halfway done! Except that the rows get longer as I go, so I'm really not halfway done, but I've done more than half the rows so that should count for something. Well, its my blog and I say it counts. *If you Googled your way in here because of that phrase, you can Google your way out again. Or buy a pattern and then Google your way out. Or learn to knit. You probably need a hobby anyway. By hobby, I mean a socially acceptable one you can show your mother, she would be so proud! I pulled the blocking wires (I love those things) out of it yesterday and here it is! It ended up being 68 inches across the top edge. Here are all the details. The yarn is less than 2 ounces of Merino/Silk top, handdyed by Kendig Cottage in the Iris Garden colorway (scroll down) that I handspun into a two ply, keeping the colors in the same order. They don't line up perfectly so I ended up with a yarn that blends from one color to another. The weight of the yarn is slightly finer than Jaggerspun Zephyr. 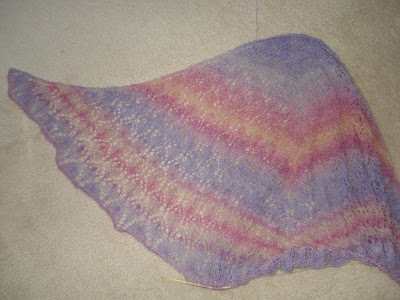 I used size 5 US (3.75mm) needles and followed the pattern for the Flower Basket Shawl as published in Interweave Knits in the Fall of 2004. I did work more repeats of the Lower Flower Basket Chart before doing the Edging Chart - I have 16 flower baskets along each short side of the triangle. I also changed the double decrease from what the pattern called for. It called for a slip one, knit two together, pass slipped stitch over which is a left slanting double decrease. I used a centered double decrease: slip two together knitwise, knit one, pass slipped stitches over. This gave me the strong center lines up the baskets that run from the edges of the shawl to the center "spine." You can see how the centered double decrease looks in this shot. 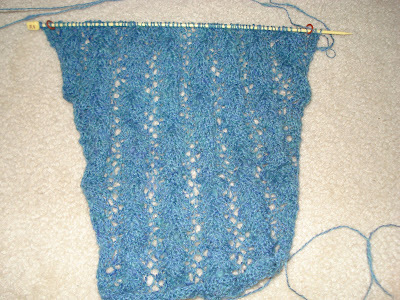 There are oodles of Flower Basket Shawl pictures on the web, so if you're thinking of making one, Google it and you can see what it looks like with the decrease the pattern calls for. Then you can decide which one you want to use. 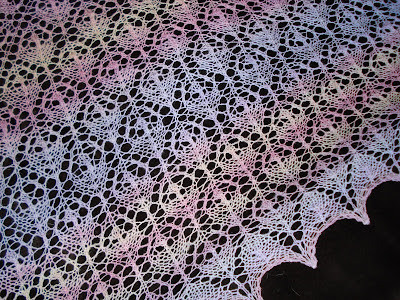 I think its going to be a perfect Spring and Summer shawl because its so lightweight! Of course, right now its too cold to wear it around here. I finally got a chance to dye some wool! 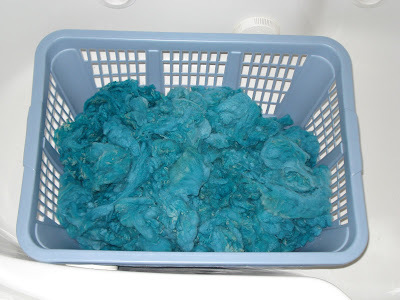 Well, I didn't have time to play with this over the weekend, but yesterday I did get some of the Targhee dyed. This is half of it and it looks slightly lighter in the photo than it does in real life. I'm thinking about leaving the other half white and then having it blended in the roving. (Its essentially the same as having two fibers blended together, except this is two colors of the same fiber - the machines don't care.) I think I would prefer a lighter color of the blue green. 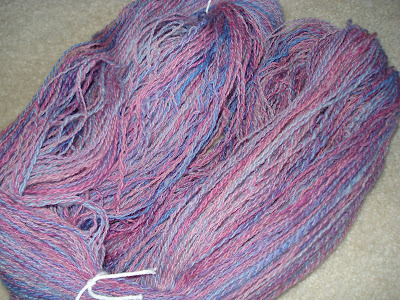 This is the first time I've dyed loose fiber and the first time I've done immersion dyeing with the Landscapes Dyes. I feel like I got the color pretty even and there is no felting or clumping. 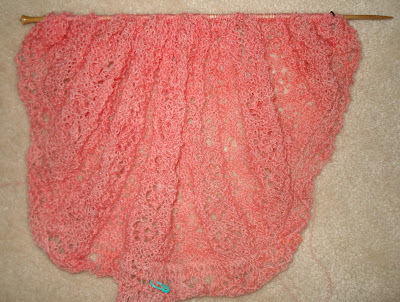 I also got the Flower Basket Shawl blocked so later today I'll be unpinning it! Pictures tomorrow with all the details! Of course since I finished up the Flower Basket Shawl yesterday, I HAD to start a new lace project. What is it? Well the yarn is my Frostrosen handspun (originally Kitchen Sink Batts) and the pattern is the Green Moss Shawl from Heirloom Knitting. Obviously, my moss will not be green. This pattern is for a semi circle shaped shawl and it starts at the bottom edge and then works its way up (very cool and different way of starting a shawl). You start with a bit of edging, part of which you can see above and then go from there. At the moment I'm having a bit of trouble with the "going from there" part but I get confused when I have to pick up stitches from Garter Stitch - the trouble is Pink Lemon based, not pattern directions based. The pattern directions seem to be well written. Once I get the caffeine flowing, I'll sit down and see if I can't get those silly stitches picked up. I also want to give a "head's up" to anyone who has been thinking of doing Sockapalooza 4 - SIGN UPS ARE OPEN! Head on over to The Blue Blog and read through exactly what is involved and if you want to knit some socks for a complete stranger, sign up! Who knows you could knit socks for me, or I could knit socks for you, or we could both knit socks for completely different people we've never even heard of! Oh, the suspense of it all! I'm heading over and signing up as soon as I finish this post. ...the Flower Basket Shawl! That's right, I'm binding off now. Since you saw it last, I ended up doing two more repeats of the Basket Chart before I started the Edging Chart and I think I figured it just about perfectly. I'll have some yarn left over, even after the yarn eating lace bind off, but I don't think I could have gotten another Basket Chart repeat out of it. 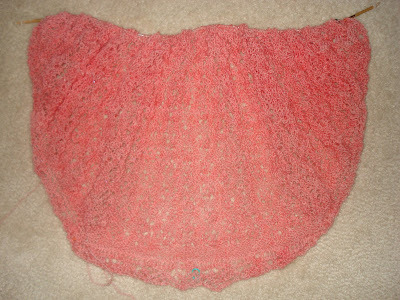 My big goal for the day is to get the shawl off the needles and maybe I can get it blocked today. It feels like I have been knitting on this forever and last night I realized that I had. 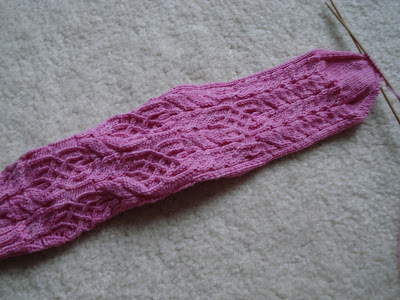 I started this back in October or November, but then set it aside to knit Mindy's Stole/Hanami. This poor little shawl has just been sitting patiently on the needles waiting for me to get back to it. When I finally did, it didn't cause any trouble, drop stitches, make mistakes, or any of the other huge list of things that neglected knitwear can do. Once I get this blocking, I've already got my next lace project picked out! You'll just have to wait and see what it is! Spinning and a Woo Hoo! I finished up the sock yarn this weekend! I ended up with 396 yards of two ply - this is the GCNI/mohair I showed singles of at the end of last week. I love the way the colors came together - I know this is going to make a pretty pair of socks. I got some big news this weekend. When I got my MDS$W book this year, I decided that it would be really great to take a class there this year - specifically Comprehensive Spinning with Judith MacKenzie McCuin. It's a 3 day class (yes, you read that right) and the best part is that it runs Wednesday, Thursday, and Friday, so I won't miss out on any of the Festival shopping! My wonderful husband was able to get the time off from work so he can get Caleb to school and hold down the fort around here so he said to go ahead and try to sign up. Well, I emailed the people in charge of workshops to find out how we would be notified if we got in or not, and apparently there is a postcard in the mail but they also went ahead and told me - I got in! I have never taken a spinning class before. 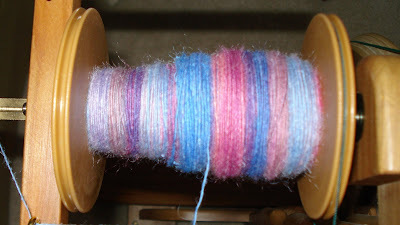 I learned to spin with a drop spindle, some Coopworth roving, and a downloaded video on spindle spinning. (I'd link, but I think the domain name just changed. I'll double check and get a link up later this week.) Once I had figured out the spindle spinning, it wasn't any trouble at all to switch to a wheel. I'm pretty comfortable with my wheels, going around changing ratios, tightening and loosening the take up, and messing around with them until it feels right. I really feel like figuring it out on my own gave me the freedom to make mistakes, but also to do some things that any sensible person would be scared of as a beginner. When I started spinning, I was spinning just to spin. I love the feel of the fiber, the soft whisper of the wheel, and it's just fun to make your own yarn. Now that I'm almost 3 years into it, I find myself starting to take a more technical approach to spinning. I want to be able to spin different types of yarn. I want to understand why a highly twisted singles balances faster as a 3 ply than as a two ply. I want to be able to repeat my successes and understand why things don't work out as well as they should have (in my head at least). There is a huge amount of information and techniques with spinning that I just don't know. (I have two different draws* in my spinning. We will learn six in this class. I didn't even know there were six draws.) I just feel like there's so much that I don't know about spinning, even though I can spin a respectable looking yarn that doesn't fall apart. I am so excited about this class I'm hopping around the house chanting, "I got in, I got in, I got in!" I can't wait for May to get here! *A draw is the way you pull the fiber out to draft it either before the twist enters it or as the twist is entering it. Once you've got the twist in your fiber, you've got yarn. If anyone who is a more experienced spinner would like to clarify this definition in the comments, that would be great! Last night I needed something mindless to do while I watched TV so I pulled out the second batch of roving that I hand dyed a while back. 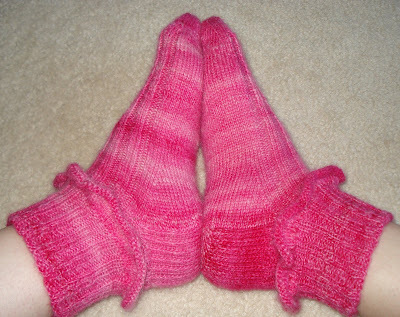 (The first batch was the Barbie pink that became the ruffled socks I finished last weekend.) 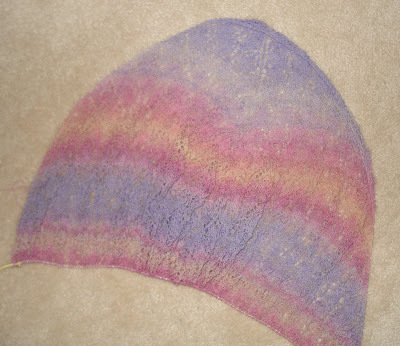 This is the GCNI/Mohair that I painted in sections of blue, pink, and tiny yellow stripes. The yellow bled into the pink so there are some coral colored sections but no yellow is left in the roving. I'm just going to spin up half on one bobbin and half on another bobbin and ply them together letting the colors land where they will. I'm figuring that over all the yarn will look purple but there should also be some blues and pinks mixed in as well. Yesterday, Finn and I worked on fluffing up the Targhee fleece that I had washed a week or two ago (the one Finn was, and still is, in love with). I'm going to dye it before I send it out to be carded into roving so I wanted to make sure it was completely opened up and fluffy so the dye can get in there. Its not felted, but since this was an uncoated fleece, some of the tips are stuck together. I have no idea what to call it, but they open right up and if I wasn't going to dye it, it could go straight to be carded and it wouldn't have any trouble at all. Finn kept trying to kiss it when I wasn't looking, but when I'd turn back around to get more wool and it was damp and the dog was looking everywhere but at me, I figured out what was going on pretty quickly. Then he sat down and watched me out of the corner of his eye, which is really a funny facial expression for a dog. Caleb wanted to help too, so I showed him what I was doing and he started fluffing tips, until he got bored, started putting wool all over his head and declared himself "King of the Sheep." Finn thought this was hysterical so he jumped on Caleb. At that point we quit and I'll finish it up today. Hopefully there will be more than Easter Eggs getting dyed this weekend! I promised no more than one update a week on this and I think its actually been about two weeks since I bored you with my Rosemarkie Spinning! Of course, seeing as this is my first bobbin of what will be four bobbins of singles and I'm not quite done with the spinning on it, that doesn't say much for my spinning speed. It could also be that I haven't really spent as much time spinning on this as it deserves too. It is spinning up beautifully in my opinion and I think I'm keeping things pretty even. I probably need to spin up something else on the Rose, just to give myself something different to spin while I'm in the middle of my Epic Spinning Adventure (to be followed by my Epic Knitting Adventure). I've added 12 rows since you saw it last week! I've also made some decisions regarding how much more I'll do on it. I will finish the repeat of the Flower Basket Chart I'm currently working on (8 more rows) and then I will begin the Edging Chart (10 more rows). I wasn't going to work another repeat of the Flower Basket Chart after I finished the last one, but looking at the size of the ball of yarn I have left, I'm pretty sure (cross your needles, knock on wood and anything else you can think of to distract the knitting goddess) that I can do an extra Flower Basket Chart repeat and then the Edging Chart and have enough yarn. Of course after deciding that this was my plan and starting the last Flower Basket Chart right before bedtime, I had two separate dreams involving running out of yarn mid-project. Neither project in my dreams was the Flower Basket Shawl (one was the Vine Lace Cardi - there's no way I won't have enough yarn for that, I can spin more; and the other was actually not a real project at all, but a dream project so I don't really care if I run out of yarn on it - HA HA). Of course I could have weighed the yarn I have left just to guesstimate, but that seemed too complicated last night. So either the Flower Basket Shawl is well on its way to getting finished, or it will go down in a ball of flames as I run out of yarn 10 yards from the end - either way, it should make for some good blogging! Pink Sock, Pink Sock, Everywhere a Pink Sock! I finished up my handspun ruffled pink socks! I love the way they aren't perfect twins - sock brothers are fun too! I have 2 1/8 ounces of yarn left so I must have used just over 3 1/2 ounces to knit these. This pink should coordinate with the other GCNI/mohair that I dyed in the other colors, so I should be able to get some striped socks out of all the leftovers. Of course I'll have to get the other two rovings spun up first. 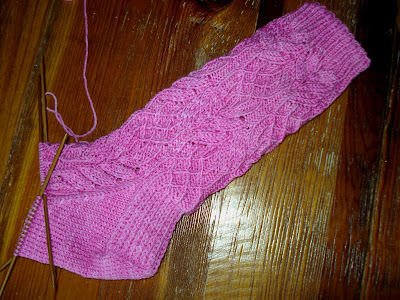 These are Cookie A's Twisted Flower Pattern Socks being knit in Lorna's Laces Shepherd Sock Nearly Solid in Pale Pink. I probably won't do the flower pattern on the heel flap the way she shows because I don't wear clogs and a standard Heel Stitch or Eye of Partridge heel flap will wear better in shoes. The flower design flows into the twisted stitch design so perfectly in these it's just amazing. I've only got 12 more rounds until the heel flap and I'm really having trouble putting these down!